(15/P41) TRENTON – The Christie Administration today joined with the U.S. Army Corps of Engineers’ Philadelphia District to announce the start of construction on a $128 million contract to complete beach and dune projects for Long Beach Island that will protect lives and property against future storms such as Superstorm Sandy. Department of Environmental Protection (DEP) Commissioner Bob Martin and Army Corps Lt. Colonel Andrew Yoder, of the Philadelphia District, were joined by U.S. Rep. Frank LoBiondo, Ocean County freeholders, mayors and other dignitaries at a news conference in Ship Bottom to mark the beginning of the series of projects. The projects encompass a total of 12.7 miles of beaches in Long Beach Township, Ship Bottom, Beach Haven and part of Surf City. They will complete storm damage reduction projects that were being constructed in phases prior to Sandy striking New Jersey in October 2012. The contract to complete the initial construction on LBI is funded 100 percent by the federal government under the provisions of the Sandy Relief Act, signed into law in 2013. The Army Corps’ contractor, Great Lakes Dredge & Dock Co., will construct beach and dune systems ranging from 325 feet to 415 feet wide. The beach berm itself will be built up to approximately eight feet above sea level. The dune system behind the beach – critical to protection of property, infrastructure and lives – will have a top elevation of approximately 22 feet above sea level. The Long Beach Island project, also known as the Barnegat Inlet to Little Egg Inlet project, is one of seven significant beach improvement projects statewide authorized by Congress but never completed before Sandy hit. Ultimately, eight million cubic yards of sand will be pumped from an approved “borrow area” approximately three miles offshore. Work will be done in small sections of no more than 1,000 feet of beach at a time in order to minimize any disruptions to residents and visitors. 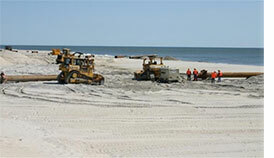 Beach fill work is expected to take place at the rate of about 100 to 250 feet per day. Ship Bottom – May to early June of this year. 57th Street to 106th Street in Long Beach – July to October of this year. Prior to Sandy, the Army Corps completed the initial construction of the project at Surf City (3rd-22nd street) in 2007; Harvey Cedars in 2010; and Brant Beach (31st and 57th Streets) in Long Beach Township in 2012. The Army Corps repaired previously constructed beaches in Surf City in 2011, and fully restored all previously constructed beaches within the three communities after Superstorm Sandy. 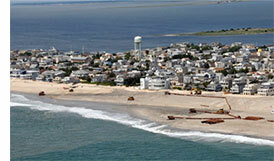 Long Beach Island stretches 18 miles from Barnegat Light to Holgate. With the start of the LBI project, the Christie Administration continues to make significant headway in bolstering New Jersey’s coastline, a key driver of New Jersey’s tourism economy that pumps some $40 billion in tourism revenues into the Garden State each year. Two of those projects – at Oakwood Beach along the Delaware River in Salem County and the Raritan Bay shoreline in the Port Monmouth section of Middletown – were completed last year. Last month, the Christie Administration and U.S. Army Corps of Engineers launched the start of a $57.6-million project to construct beaches and dunes in southern Ocean City, the Strathmere section of Upper Township, and Sea Isle City in Cape May County. At the same time, the administration announced the start of $38.2 million project to construct beaches, make stormwater outfall improvements and implement modifications to other shore protection structures in the area of Loch Arbour, Allenhurst and Deal in Monmouth County. Other beach construction work planned to begin this year include completion of Brigantine Inlet to Cape May Inlet, Absecon Island (at Margate and Longport) and initial construction of the Manasquan Inlet to Barnegat Inlet project along the Northern Ocean County peninsula, to include Point Pleasant Beach, Bay Head, Mantoloking, Brick, Toms River, Lavallette, Seaside Heights, Seaside Park and Berkeley. Last month, the Christie Administration and the Army Corps of Engineers, also announced a $202 million resiliency project that will bolster storm protection for Union Beach along Raritan Bay, one of the communities hardest hit by Superstorm Sandy. The majority of funding for this project will come from the federal government at $132 million. New Jersey will fund about $53 million and Union Beach will provide $17 million. This project, involving beaches, flood walls, levees and flood gates, is expected to be launched in late 2016.